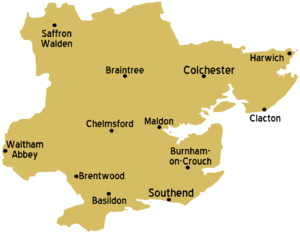 Essex is a large county in the East Anglia area of England. Essex's largest island: lies off the coast near Southend and has been under M.O.D. control since 1916. Contrary to popular belief and stereotypes, Essex is not actually an urban wasteland. This stereotype exists partly because some parts of London are still informally considered to be parts of Essex and the part of Essex around the Thames estuary contains a large amount of urban sprawl and commuter towns which account for around half the county's population. However most of the rest of the county is rural, and has some very beautiful scenery that is not widely known to outsiders. Saffron Walden, in the north-west of the county, epitomises this defiance of the classic Essex stereotype, as do many of the smaller towns and villages. Obviously an English-speaking county, but accents can vary in Essex. In the northern and rural areas of the county, you are much more likely to hear the traditional East Anglian accent. But in the south of the county the most commonly heard is known as the estuary accent; some say this is a cross between cockney and East Anglian. Mountfitchet Castle is an all-weather heritage entertainment complex in Stansted Mountfitchet. Formerly an Iron Age hillfort, the castle also has a Roman, Saxon and Viking past and therefore provides an interesting and historical day out for the whole family. There is a reconstructed castle, many houses complete with all the smells of a bygone era and a toy museum. In addition, as you stroll through the grounds you will encounter plenty of rescued animals roaming freely: deer, goats, geese, peacocks, chickens as well as Jacob Sheep. There is a substantial restaurant on site. The Blackwater Estuary in Essex is used for the farming of high quality oysters. Mersea Island is a good place to head for oysters and there is a good selection of farmed, wild and native varieties. In the more rural parts of Essex it is not uncommon to find local game (including: partridge, pheasant, pigeon, rabbit and venison) on the menus of good quality restaurants and pubs. Tiptree is the home of the now global jam and marmalde producer Wilkin & Sons. Much of the products being produced with fruit from the company's own local fruit farms. Contrary to popular belief, Essex actually has one of the lowest crime rates in England. However some poorer towns in the more urbanised south and west of the county should be approached with caution, especially at night. As with the rest of the UK, in any emergency call 999 or 112 (from a land-line if you can) and ask for Ambulance, Fire or Police when connected. This page was last edited on 2 April 2016, at 17:33.